As shown by the ISIS attacks to the ancient cultural sites of Palmyra and Nimrud in 2015, cultural heritage in the areas of crisis is still today in great danger. Different reasons can explain why it becomes a fair game during the periods of serious instability. If ideological aspects – that is the will of strike symbols and remove the historical memory of any previous religion, culture or civilization – are fundamental, we should not forget that antiquities are a relevant source of enrichment during the periods of war. So taking into account this peculiar aspect of vulnerability it seems to be clear that the answering to some fundamental questions cannot be delayed anymore. Could we protect cultural heritage in the area of crisis? If yes, how? And who should carry out this task? Fabio Maniscalco has had no doubt. Cultural Heritage must be protected also in the war areas. So who was Fabio Maniscalco? 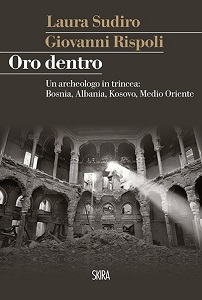 Laura Sudiro e Giovanni Rispoli, authors of “Oro Dentro”, tell us the extraordinary story of “an archaeologist in the trenches”, as they called him. Archeologist for passion and pragmatic for nature, Fabio join the Italian Army after completing his university studies. In 1996, he participates to the NATO mission in Bosnia and Herzegovina, during which he promotes the creation of a team responsible for the monitoring and safeguard of Bosnian cultural property. Because of the violent ethnic conflict, in fact, the country had lost most of its cultural institution and monuments, included the Vije?nica, the National Library of Sarajevo, which had been until then a symbol of pacific coexistence between different civilizations. The importance of this monitoring mission lies in the fact that for the first time in the world, someone has put into effect the article 7 of the 1954 Hague Convention for the Protection of Cultural Property in the Event of Armed Conflict and that someone was Fabio Maniscalco. From Bosnia to Albania. In 1997, Fabio replicates the Bosnian experience in Albania. Better equipped than in the first mission, he explores the country in order to monitor the status of Albanian cultural heritage. Contrary to what was happened in Bosnia, in Albania the real enemy of cultural goods was not destruction but negligence and looting. In fact, as noted by Maniscalco, “the whole Albania was like a great chest”, which fueled a thriving illegal market of artworks. In 2000, he will find a similar situation in Kosovo. After the experience in the Italian Army, Fabio starts his professor career in the University of Naples, his native city, without interrupting his practical commitment to safeguard cultural heritage, as demonstrated by the pioneering operations of underwater archeology promoted by Maniscalco in order to map the archeological ruins of Baia, submerged because of local volcanic activities. But not only. As specialist of protection of cultural heritage in the areas of crisis, he follows with great attention the instable situation of Middle-East and during the second Intifada, in 2004, he goes in Palestine, where he takes part in the project of Blue Shield aimed at putting symbolically a Blue Shield on some relevant cultural goods at risk in the West Bank and Gaza Strip. Using an original style, which alternates past and present events and combines biographical elements and records of people who knew Fabio Maniscalco or had worked with him, the authors of “Oro Dentro” bring readers on a passionate journey in the human and professional experience of a non ordinary man. He was a pioneer in the field of protection of cultural heritage in the areas of crisis and he gave his life to achieve this mission. In 2008, in fact, Fabio Maniscalco dies in Naples, because of a rare cancer of the pancreas caused by the exposure to the depleted uranium and heavy metal in Bosnia and Herzegovina. Un archeologo in trincea: Bosnia, Albania, Kosovo, Medio Oriente. : Gold inside. An archaeologist in the trenches: Bosnia, Albania, Kosovo, Middle East.